Nearly 150 creative coloring contest submissions covered our judging tables this month! 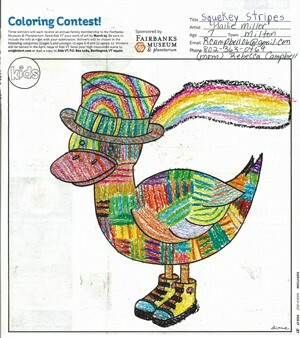 Eleven-year-old Zoey Copp summed up the spring season with her bright yellow duck surrounded by a storm of rainbow drops. 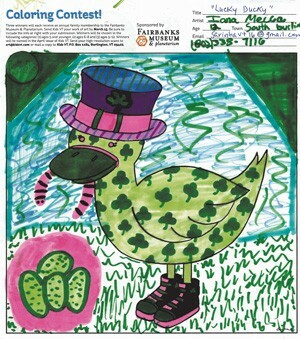 Madeleine Lantman, 5, dressed her waterfowl in a green top hat surrounded my multicolored grass. Lucia Hackerman gave her masterpiece an interactive twist, challenging our judges to find the four-leaf clovers hiding in her green mosaic. At right, find the three winners of annual memberships to the Fairbanks Museum & Planetarium. Someone who inspires me is my older sister, Firdaus. She inspires me by being confident about herself. She does this by talking in a loud and clear voice. Another thing she does that inspires me is to persevere and never give up. For example, I take ice skating lessons and there’s on trick that I can’t complete. My sister knew that I was struggling so she helped me learn the trick. I ppreciate her and I am pleased to call her my sister. Seven months ago my mother was diagnosed with cancer. I remember the night so clearly, me and my sister out on the porch in the crisp, tranquil night air, the tears. 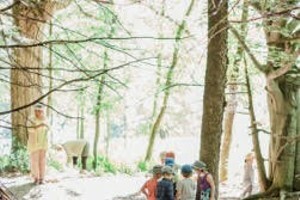 The air, the earth and the trees felt so indifferent, blowing around in the late autumn silence. I was shocked. I had no idea, not even the slightest hint that my mom, a healthy, fit, productive woman somehow could even have a risk of getting such a horrible disease. I was still shocked, when months later she ecided to do chemo. And again I was shocked, when the beautiful hair began to ruthlessly but slowly fall off her head. But I was even more amazed at how she handled this horrible process of destroying the monster that was trying to eat her, take her. She stood strong and tall above that monster, beating it back but paying for every inch of it. She still isn’t done beating that horrible monster back, but she’s close. She didn’t flinch, or try to hide. No, not my mom. She took that monster and wrung its neck. She took it and tossed it right out the window, strong and hard. And that is the woman who inspired me, told me through her actions that even when things are hard, you keep fighting, don’t flinch away. Never back down. And I will take that and listen to it. Thank you, mom, for showing this to me. 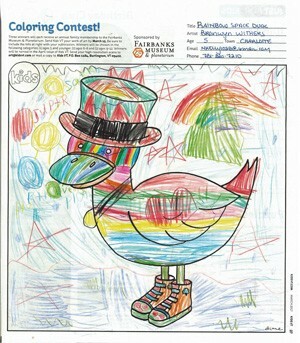 Find the Kids VT Writing Contest on page 40 and the Coloring Contest on page 41 in our April issue! You have until April 15 to submit your entries.